Our soils are eroding, our freshwater supply is dwindling, and our atmosphere is warming. Volatility is the new normal. According to the Food and Agriculture Organization of the United Nations, at least 33 percent of land is significantly degraded by erosion, salinization, compaction, acidification, and chemical pollution of soils. NASA reports that 21 of the 37 largest aquifers in the world are depleted. Global agricultural emissions from crop and livestock production exceed 5.3 billion tons of CO2e and are rapidly rising. The way we feed ourselves has transformed the planet. Despite agriculture’s heedless productivity, more than 795 million people—49 million of them in America alone—do not have enough to eat. While millions starve, we waste 1.3 billion tons of food globally (35 million tons in the US) each year. Dominant agrifood systems are simply unsustainable. The Rian Fried Center for Sustainable Agriculture and Food Systems (RFC) was founded upon reverence and concern for the critical connections between farm, food, and community. America’s great agrarian poet, Wendell Berry, plainly reminds us of these dangerously eroded but fundamentally unbreakable ties. For several generations, most societies have neglected this interdependence at great peril to their physical selves, their identities, their planetary home and cohabitants, and the well-being of their descendants. But before we simply advocate for “sustainability,” we need to make sure that our systems are worth sustaining. The systems we support must be restorative and resilient: diverse and distributed, innovative and inclusive, natural and just. As we pursue a more sustainable food future, we must ask ourselves: What does a healthy and productive agricultural ecosystem look like? What must we do to return the earth to a homeostatic state that supports both human thriving and the persistent evolution of diverse species co-inhabiting this planet? How can we nourish ourselves—body, culture, and community—without impairing the ability of future generations to do the same. Recognizing that building a healthy and just food system is among the most critical challenges facing humanity in the 21st century, the Rian Fried Center for Sustainable Agriculture & Food Systems (RFC) at Sterling College cultivates the next generation of environmental stewards with exemplary education and research opportunities that restore functional ecologies, revitalize connections between people and place, support vibrance and health, and promote regenerative economies of the working landscape. In alignment with the Sterling model of environmental stewardship education, the RFC is the instructional laboratory for an experiential and place-based curriculum that unites the farm, forest, and kitchen. The Center models food and education systems grounded in ecological principles that enhance nutrient recycling, support the biodiversity of species and genetics, increase the socioeconomic viability of communities, and build the practical skills and critical thinking capacities of our students. The RFC also collaborates and develops programs with local businesses, landowners and not-for-profit organizations to build academic partnerships that broaden the College’s curricular offerings and strengthen the regional food and agroecological systems. Because the RFC fosters mindful and active connection among Sterling College’s farm, forest, and kitchen, students experience what it means to be part of a small, integrated, values-driven food system. The RFC also serves to connect Sterling College with the greater community of farmers, food producers, and activists in our region, which gives students frequent and ample opportunity to learn directly from Vermont-based and nationally influential visionaries and change-makers. Through the immersive experience of hands-on education and work in community, Sterling students develop a much more sophisticated understanding of the issues currently facing food systems locally and globally than peers who study similar subjects at more traditional schools. Our students also acquire and hone skills that can be used to revitalize and regenerate the full agri-eco-social system. Because we apply—and eat— what we teach, the opportunities for paradigm-shifting applied farm and food system education at Sterling College are unrivaled. Students in Organic Crop Production class take a visit to the High Mowing Organic Seed trial fields to learn more about performing trials. T he Center is named in honor of Rian Fried, a pioneer in social investment and a patron of the local food movement who passed away in 2013. In the mid 1980’s Rian co-founded Clean Yield, an asset management company that supported the growth of food based companies such Vermont Smoke and Cure and High Mowing Seeds. Fried believed food was the foundation of a healthy economy and invested in socially responsible food businesses. He served on Sterling’s Board of Trustees and encouraged us divest our endowment from fossil fuels. Rian’s legacy lives on through the innovative approaches to agriculture and education fostered at Sterling College in his memory. The Rian Fried Center has also been generously supported by the Peter Alfond Foundation. 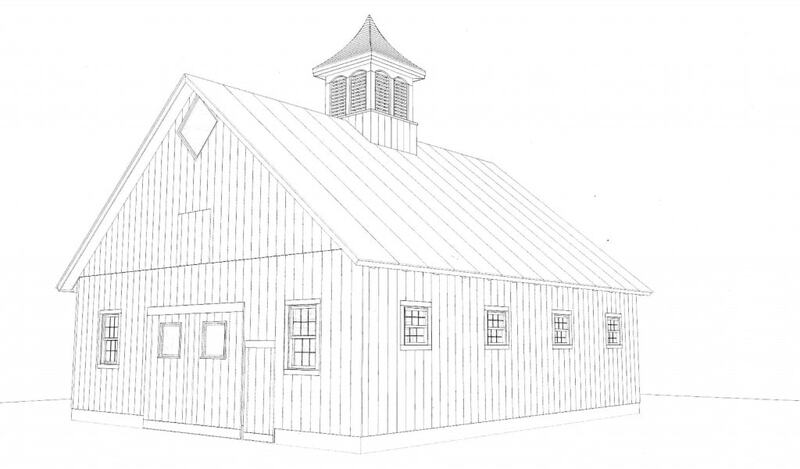 The Alfond Draft Horse Barn, a 1500 square foot timber frame barn, provides safe and comfortable housing for Sterling’s working horses. 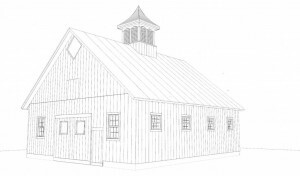 The Alfond Farrier Shop and Forge, built as part of an educational collaboration with the Yestermorrow Build and Design School, will house a masonry forge capable of burning charcoal processed from wood harvested on campus and a 400 square foot smithy for Farrier Science classes and workshops. 90% of the lumber for this project was harvested from Sterling’s woodlot, extracted using horsepower and milled on site. Since the college’s inception, Sterling Farm has been a prominent feature of a Sterling Education. Through academic study, the work program, and day-to-day community interactions, our diversified and ecologically focused farm is a key part of everyday life here at Sterling. 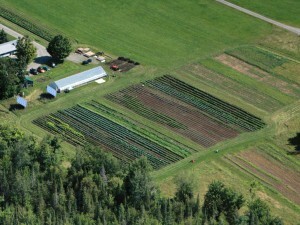 The Farm is managed as an integrated system of 5+ acres of garden, 20 + acres of pasture and 390 + acres of forested land. We grow around 60 different annual vegetable crops, as well as perennial small fruits, nuts, apples, and other tree fruits. We raise all our livestock in ways that allow them to express normal behaviors and are modeled on natural systems. Draft Horses are the main power source on the farm for cultivation. 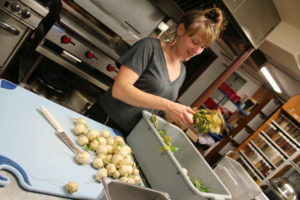 The Sterling Kitchen is part of an intentional and circular food system: it sources upwards of 20% of the food it serves from the Sterling Farm and returns its non-edible excess to the farm for composting. To further its commitments to freshness, place, the local, land-based economy, the Sterling Kitchen prioritizes local sourcing for the balance of its food needs. The Kitchen’s evolving food acquisition practices, mindful use of energy, and close collaboration strengthen our community-based food system, allow us to share mealtimes and savor flavorful food, without compromising our values. The 393 acre Sterling Forest features both wild and sustainably managed lands that serve many purposes. The forest is a learning laboratory for Sterling’s low-impact and restorative forestry, draft horse, sustainable agriculture, foraging, ecology, natural history, and outdoor education classes. It is a site for recreation, especially during the snowy winter months. And, of course, it is a place where we can enjoy the peace of the North Woods and appreciate the array of trees, breeding and migratory birds, white-tailed deer, and countless other species that reside therein . 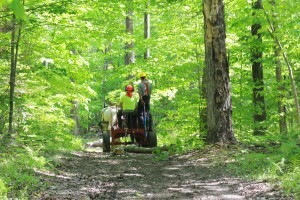 The area adjacent to the Sterling Forest is also very sweet to us: Every spring, students collect sap from the maple trees in a 20+ acre section known as the Virginia Russell Sugarbush, transport it to the sugarhouse on campus with help from draft horses, and boil it down into delicious maple syrup that we enjoy throughout the year. All work in the Sterling Forest is guided by a forest management plan that is grounded in the principles of silviculture and was written by a forester. Overall land management, including decisions to leave areas undisturbed and protect habitats, is performed collaboratively by the RFC team and our colleagues in Ecology. Forestry Management and education at Sterling College is enhanced by the presence and participation of LaMoille County Forester Jared Nunery, who maintains his office in Sterling College’s South House. Interested to learn more about or propose a collaboration with the Rian Fried Center? We love working with our Community and would love to hear from you!